Choose to be Happy: little bits of one florida road trip! 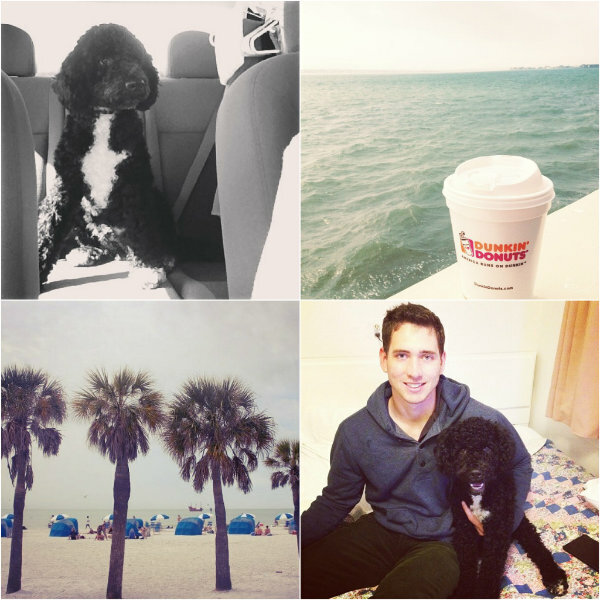 little bits of one florida road trip! we are back! i 100% hate leaving my stone. those goodbyes are still not really my favorite. like at all. but hellos are, so that drive of ours was worth it. and charlie did so good! i mean, better than me. i was complaining a bunch of times in my head. but he was just happy. watching cars and sleeping. so when we finally arrived and were met outside by a stone, charlie first gave a little beep of a bark, like ah! who is this tall smiling creature walking towards us! and then he realized, duh! its my human boy love! and just attacked him with love. but i got the first hug and kiss. so we were all pretty happy. the whole trip was great. the weather was good, much better than i expected. our hotel room was the tiniest room ever but right across the street from the beach, charlie met the water, and we had fried clam strips on more than one account. it was a good one. i love them. the end. I know how darn crappy those goodbyes can be, but it sounds like you had a wonderful time the three of you at the beach! Sounds so perfect! I hate being away from Husband, but I love missing him..only because of the reunions! ;) So glad you got to see your man!